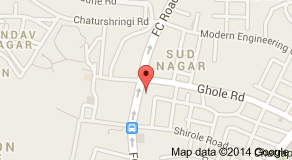 Located right opposite the Fergusson College in Pune, Hotel Ashish Plaza is a known name in the city. It is home to Aakash, a multi cuisine restaurant and bar, Raj Baug, a beautiful garden restaurant, Award, a fully equipped conference hall, Ashwin, a board room with a capacity of 30 persons, and Machan, a unique roof top board room. There are 35 rooms at the hotel plus one suite with all modern amenities such as an attached bath with top range fittings, air conditioning, a Television in room, a comfortable mattress, and prompt and diligent room service. The rooms are spacious and well decorated and allow privacy in the midst of the city centre. Other facilities include running hot and cold water, same day laundry service, satellite TV channels and a buffet breakfast. The reception area is warm and welcoming. Free WiFi is provided in the lobby. The hotel is monitored by CCTV cameras. Hotel Ashish Plaza also provides ample parking space for all vehicles. The travel desk at the hotel is extremely useful in case a guest wants to explore the city or its outskirts. It is located just 4 km from the Pune Railway Station. The tariff ranges between Rs. 3000 to Rs. 5000. All major Credit cards are accepted at Hotel Ashish Plaza.